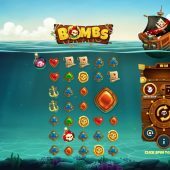 Bombs slot by Playtech is their first attempt to join the grid cascade series which began with Play'n Go's Gemix and has since spawned numerous others including Red Tiger's Tiki Fruits and Relax Gaming's Temple Tumble. Here we have a cartoon pirate theme where the sound is of the wooden ship's wheel turning mixed with cannon fire and shouts as bombs are fired into the ocean. The reels are transparent and are below the surface of the water for reasons we'll discover, so will these bombs be blowing our bankroll out of the water too? Bombs slot has 5 reels of 7 rows each and remarkably only costs 20 coins to play as there are only 20 fixed pay lines! Symbols are stacked including Wilds and you even get some landing as 2x2 block icons too. The 5-of-a-kind pays are 20x for Wilds in the form of a Treasure Chest, Redbeard 10x, Anchor 6x, Gold Coin 5x, Map 4x with four card suits offering either 1.5 or 1x. There are Red Skull scatters which can appear anywhere on the grid which activate features in quite an odd way! 10-Bomb - awards a win of up to 10x bet. Pink Wild - 5 to 10 random Wilds placed on the grid. x10 - a multiplier, can bet 2 to 10x which applied to all wins on the grid. Yellow Skull - detonates all bombs on the grid at once. Pink ??? - can become any of the various bombs randomly. 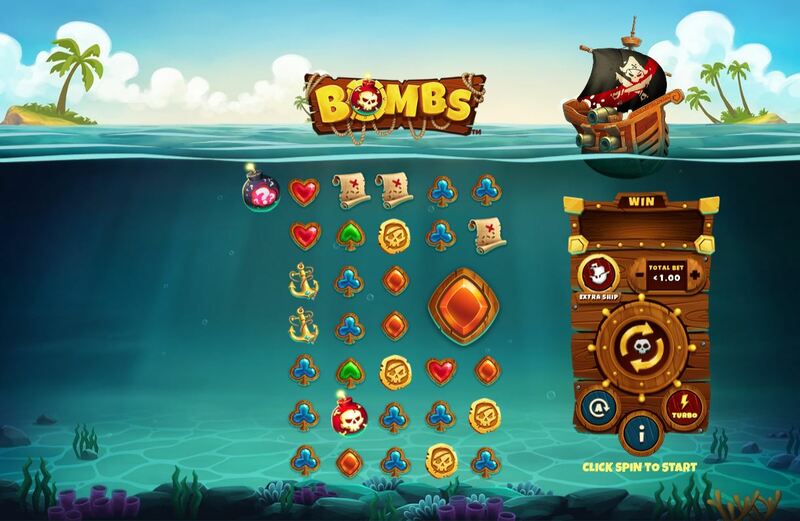 Free Games - you will be awarded 10 free spins during which more bombs tend to be fired and can retrigger up to 6 times.